Bacterial brown spot (Pseudomonas syringae pv. syringae) was found on lima bean in southern New Jersey this past week. 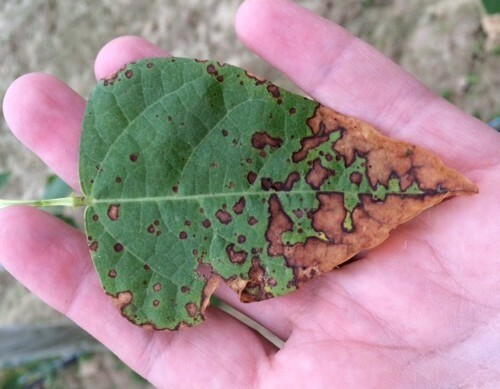 Bacterial brown spot is unusual and tends to show up under prolonged wet conditions. The bacterium is spread from the soil to the lower canopy by splashing rain and wind. Working in fields and cultivating during wet conditions can also help spread the bacterium. The symptoms that develop on the leaves look similar to a fungal infection. Copper applications may help to suppress the spread of the disease. Bacterial brown spot of lima bean. Symptoms look like a fungal infection.